While quilts have a long history and were first made to keep people warm during cold winters, they eventually grew into a beloved and respected art form as we know it today. The word “quilt” is derived from the word “culcita,” which means “mattress” in Latin. The history of quilts dates back to ancient times, with a statue of an Egyptian king wearing quilted clothing and an ancient Mongolian linen carpet being some of the first evidence of quilted fabric in history. In the 11th and 12th centuries, Crusaders returning from the Middle East introduced Europeans to quilted fabric, which was worn under their armor to keep them warm and add a layer of protection. In America, quilting became popular by the Dutch, English and Irish settlers. Quilts were invented to keep out the cold during long winters. Early settlers had drafty houses, and the thick quilts helped block the icy winds and cold. While quilts were often used as bed coverings, they were also used in other ways. They could be seen covering windows, adorning floors and even providing a form of currency. Quilts are an important part of our American culture. Emigrant women would send patterns and fabrics back and forth across the Atlantic Ocean as a way to keep in touch and keep up with what was going on in each country’s culture. Quilting became an important social activity for women. Quilting bees were formed to allow women to socialize while they completed their large, hand-sewn quilts. A 2017 quilt survey revealed that the total number of U.S. quilters stands between 7 million to 10 million. Although quilts have been created for many centuries, quilting these days is often associated with the Amish. Though Amish women didn’t begin quilting until the late 1800s, they continue to keep the tradition alive today with their creation of beautiful and intricately designed quilts. There are nearly 1,800 Amish communities across the United States. They are known for living a simple lifestyle, free from technology and away from modern society. People in Amish households prefer to focus on religion, community and family, which is why most Amish communities don’t have automobiles, telephones inside their homes or electricity. Amish quilt making history reflects the simplicity and frugality of the Amish culture. 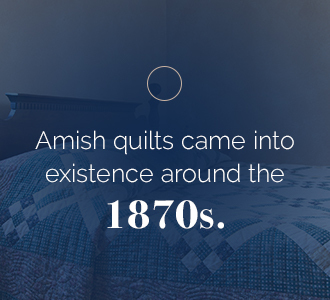 Amish quilts came into existence around the 1870s. Before that, the Amish were still using German featherbeds as their bedcovers. Early Amish quilts were made from pieces of fabric left over from garments made for members of the family. Amish women made the fabric from hemp, flax or wool which they spun into yarn and then wove into cloth. They then dyed the fabric with natural pigments. Early Amish men wore mostly black, and women wore dark colors of purple and green. Early Amish quilts, called wholecloth quilts, were usually made of only one color — sometimes with just a single layer of fabric placed over the top — with decorative quilting patterns. Early Amish quilts, made for bed coverings, often contained fewer patterns but became even more detailed and elaborate as the years went on. Amish quilts eventually evolved until they had various shapes cut out, pieced and sewn on top of a layer of fabric. In Amish culture, Sundays were reserved for church services and special gatherings such as weddings and funerals. These events were held at different community members’ houses. When guests arrived, they would place their coats on the family bed. Just as important as “Sunday Best” clothing, beautiful and elaborate quilts were brought out for display during special occasions. Quilting has always been an important activity for Amish women. Quilting circles became social gatherings where women would meet to sew together and discuss homemaking and other community news. These gatherings were a source of entertainment for Amish women. They also provided an opportunity to talk with the younger Amish girls and teach sewing techniques to them. Here, girls were taught the things they needed to know about caring for a home and family. Girls in the Amish culture are taught how to sew from a very young age. As young women, they usually begin sewing quilts to use when they have a house and family of their own. Amish fathers often build their daughters hope or blanket chests to store these quilts and other housewares, with the hope that they will one day marry. In the early days, quilts were sewn exclusively by hand. Later, women sewed both by hand and with a foot-powered sewing machine run by a treadle. The piecing for the quilt top is usually sewn together with a machine, but quilting is always done carefully by hand. Amish women still use non-electric sewing machines powered by generator, gas or foot. The quilt patterns often told stories about the women who quilted them: their beliefs, emotions and events that were going on in their lives. Quilting became a means of expression, which was acceptable to the Amish community since the actual creation of a bedcovering was a practical task. These beautiful patterns were created without the influence of the outside world — no television, magazines or knowledge of modern fashion, style trends or culture. Typical Amish quilts usually have a dark background of black, blue, purple or dark red with splashes of bright, solid color. Early Amish quilts consisted of mostly solid material, as printed fabric was deemed too fancy. Modern Amish quilts feature a variety of both solid and printed designs and more updated styles. Quilts are made of three layers: a layer of fabric over the top, a layer of soft batting in between to add thickness and a layer of fabric on the bottom. Antique Amish quilts featured cotton batting to add loft and thickness. Polyester batting became available about sixty years ago and is still widely used in most modern Amish quilts. The first step to sewing a quilt is to prepare the top, which involves laying out the main top fabric and piecing together the shapes that make up the quilt’s appearance. The top design is usually sewn onto the top by machine. Second, the middle layer of batting and bottom layer of fabric are pieced together. Third comes the hand quilting to sew all the layers together. Fourth and last is the addition of a binding around the edges to finish off the quilt. Once pieced together, the quilt is then placed into a large quilting frame to hold the layers taut, and the hand quilting is done. Amish quilts are known for their neat and uniform stitching, which takes many hours of careful work. Most quilts are made in the winter, as the Amish women are busy in the warmer months tending to farming and gardening. Most Amish quilts are done with patchwork, meaning that pieces of fabric are cut into shapes and formed or “patched” into distinct patterns. Amish quilts can also be made in the appliqué style, where small pieces of fabric are sewn together to form a picture. The beautiful patterns found on Amish quilts were not only created from the fabric shapes, but also the quilting stitches put in place to hold the quilt layers together. Popular Amish quilting patterns can be seen in the shapes of feathers, swirls, diamonds, vines, wreaths, flowers and grids. Though not necessarily specific only to Amish quilters, many popular patterns are frequently seen in Amish quilts. The names of quilting patterns differ according to region and culture. Double Wedding Ring: This beloved design features a double set of interlocking rings. It was frequently seen in the decorative objects of German settlers who settled in Pennsylvania. The double rings are meant to symbolize marriage, so it’s no wonder that this type of quilt is frequently made or given to newly wedded couples to celebrate their marriage. Dresden Plate: With a flower-inspired design, this type of quilt features a series of petals radiating out from a central circle. Each petal is made from a different color or pattern of fabric, and the design repeats throughout the quilt. Early variations of this style include a fan pattern with alternating fabric colors. This pattern is frequently seen in baby quilts. Log Cabin: This popular quilting pattern features strips of light and dark material sewn along the sides of a square. It gets its name because of the way the strips of fabric resemble the logs of a log cabin. It is said that this pattern was inspired by that which occurs when land is cultivated. Star of Bethlehem: A beautiful, 8-pointed star pattern makes this type of quilt one of the most beautiful, elaborate and commonly seen quilt patterns in Amish design. It is also one of the oldest. Originally made of bright colors by European quilt makers, these quilts have been transitioned by the Amish to have the plain background they’re known for today. The new design allows the beautiful starburst design to stand out. Sunshine and Shadow: This intricate pattern features many tiny squares sewn together to form rings of differently colored diamonds. The bold colors against a darker background and border are frequently found in Amish quilts. It is suggested that this specifically Amish pattern represents their belief in the importance of balance in life. The colors and types of materials used in Amish quilts of the past varied by the community. Some allowed lighter colors to be used while others deemed them unacceptable. The colors and patterns used in Amish quilting were usually discussed and agreed upon within the community, often with the involvement of the Bishop. Styles that some communities accepted were not okay in others. Quilting lost popularity by the time of World War II when many women began working outside the home and fabric was being used to aid in the war effort. At that time, women didn’t have time for quilting. Fortunately, Amish women have kept this timeless tradition alive. Though American culture has changed considerably over the years, Amish culture has remained relatively unchanged. Therefore, their expert quilting techniques have remained unchanged. Amish quilts are even more beloved today due to the reputation the Amish have for expert craftsmanship, attention to detail and hard work. Quilting, and Amish quilts in particular, gained newfound popularity after the 1976 bicentennial. This event saw a revival of all things from the past and Americans beginning to embrace their heritage. Quilting has once again become popular, and it has continued to grow in popularity ever since. 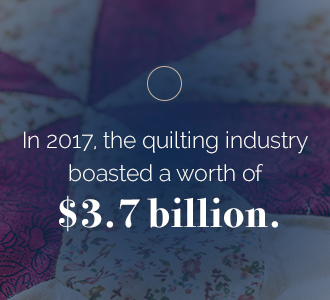 In 2017, the quilting industry boasted a worth of $3.7 billion. Amish quilts became a must-have item for fans of the pop-art movement and those living in the city. In fact, there are stories of Amish quilts being stolen right off of clotheslines by city folk who were desperate to own a piece of Americana. At this point, Amish women began to open their homes and sell their fine quilts to the public. The quilting styles of this time began to change, with modern designs reflecting brighter styles and bolder patterns. Though Amish quilts are seen as beautiful works of art, the Amish communities remain humble. To view their quilts as forms of art would be to show egotism, which is shunned in Amish culture. Instead, Amish communities allow their quilts to be sold to outsiders to help sustain their intimate communities. Quilting is still an integral part of Amish culture today, with special quilts being made for special occasions within their community and to signify events such as weddings, births and friendships. They are also seen as precious family heirlooms to be passed down throughout the generations. There are many places where consumers can buy these quilts. In Amish communities across the country, authentic Amish quilts can be found for sale either in local cottage stores or the Amish communities themselves. Many websites also feature Amish quilts for sale in all varieties and colors. While the Amish don’t use modern technology to sell their wares, some third-party sellers act as moderators between the buyers and the women who make the quilts. Amish quilts are timeless works of art. They look beautiful laid out on a bed or displayed on authentic Amish furniture. Once you have purchased yours, you will no doubt want to showcase and protect it. At AmishOutletStore.com, we are proud to offer finely crafted pieces of furniture designed to enhance and protect the natural beauty of your Amish quilt. Amish beds: Beautiful Mission- and Shaker-style beds are a good way to display your Amish quilt. Their simple-yet-elegant details and fine craftsmanship mimic the same attributes found in the quilts. Their rich finishes pair nicely with the vibrant and deep colors often found in Amish quilts. Amish Cedar or Blanket Chests: Cedar chests and blanket chests are an attractive and practical way to store your blankets, quilts and linens. Rather than keeping them in a musty closet, put them in a beautiful piece of furniture. Lined with cedar, a natural moth repellent, these masterfully created chests look gorgeous in any room. They’re available in many styles and types of wood such as oak, cherry and maple. They also come in a large variety of stains. Amish Quilt Racks: Quilt racks provide another way to display your quilts, where they can be appreciated for all to see and feel. Artfully detailed and available in several styles and wood types/finishes, a quilt rack is a great addition to any room where you want to showcase your quilt proudly. Amish Quilt Cases: A detailed, wood quilt case is a lovely way to display your prized Amish quilt. Available in a variety of wood types and stains, these cases are one perfect way to protect your possession. Our cases feature glass sides that will keep your quilt clean and safe while allowing its beauty to be appreciated. AmishOutletStore.com features fine Amish furniture that will enhance the natural beauty of your home. Our high-quality, American-made furniture is designed in the simple and elegant Mission and Shaker styles and handcrafted by master Amish craftsmen who still use techniques passed down through the generations. At AmishOutletStore.com, customers can enjoy up to 33% off our retail price every day. Contact us today to start your design of a beautiful piece of authentic Amish furniture handcrafted to your specifications.